Check out this fantastic shot of Bill Bumblaster, one of our top OS and developer tools guys, making an emergency pit stop yesterday at the Borg campus. Bill was out partying with his fellow engineers and celebrating our new SDK and overall iPhone corporate strategy which as I pointed out yesterday will finally put a stake in the heart of Windows Mobile, not to mention RIM, Nokia and everyone else in the mobile space. FWIW, Bill B. is not just the world’s greatest programmer but also a renowned tequila expert and shellfish chef. Apparently Bill and his homeboys from the tools lab spent the day yesterday on a massive bender drinking tequila shots and pitchers of beer at IL7, then they went out driving around, which I do not condone, but anyway it happened and nobody got hurt and what can we do about it. I figure you have to cut these guys some slack. Yesterday was the first day off they’ve had since their crabtacular which I bitched about recently. Anyhoo. Guys, all is forgiven. Keep up the good work. Namaste. 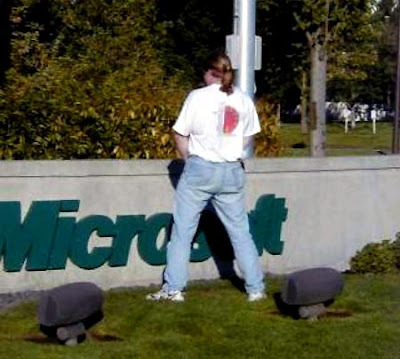 I honor the place where the contents of your bladder become one with the Microsoft logo. To see this photo in its splendid original form, go here.